Potential customers visit your site but leave without converting. Later, they surf the web and find your ads appearing online, your ads recapture their interest, bringing them back to your site and woohoo, potential customers turn into happy customers! That’s retargeting in simple words. One of the major concerns of most brands before starting a retargeting campaign is the fear of overwhelming, annoying, or creeping out their consumers. This is a valid concern. To avoid this trap, simply set a limit frequency cap to check the amount of impression each of your users is served. Not showing sufficient impressions can render your retargeting campaign as useless as running too numerous campaigns. The essence of retargeting is in its ability to keep your brand top of mind among users with continuous exposure. If you only serve a few campaigns a month, it won’t be enough to set brand awareness and solidify brand recall. The success of your campaign depends largely more on the banner ads used than any other factor, so it’s important to dedicate time and other resources into creating beautiful ads. This influences greatly, your banner retargeting. Running same ads for months will yield a weaker performing campaign. And according to research, click-through rates lowers by about 50% after roughly five months of running the same set of ads as user’s interest is no longer piqued, after the seeing the same ad over and over again. Such ads are more likely to blend into the background. You can avoid these dips in performance by creatively tweaking your ads every few months. There’s nothing that annoys consumers like seeing the same ads after making purchase or completed the an action. It’s quite easy to remove users from a retargeting campaign once they’ve converted. Simply place a line of code on your post-conversion or thank-you page. This will remove your new customers from the pool of unconverted users, and they’ll no longer see your retargeted ads. It’s important to track the success of your campaign. Relying on click-through rates as a standard of success is restricting. One good way to measure success is to check with Google Analytics, the number of visitors that are returning directly to your site or through Google. If you observe an improvement in the loyalty of visitors corresponding to the launch of your retargeting campaign, it’s an indication that the campaign is effective. 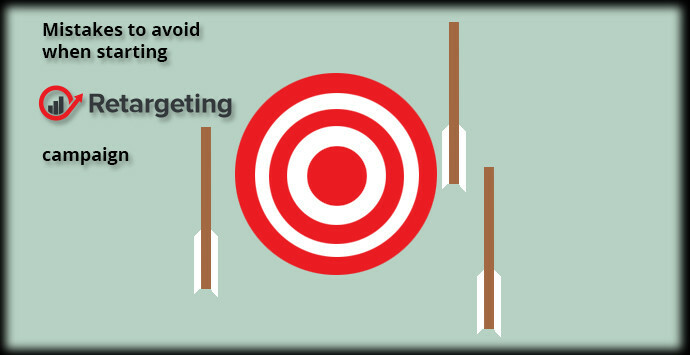 Though less severe than the other mistakes, failing to segment your retargeting campaign is not optimal. Every page on your website and each landing page should have its segment with its own set of ad creatives associated with it. Users who have spent time looking at your product or services page are at a different stage than users who have only been to your homepage. Your creative should reflect the different stages of these users’ in the purchase funnel. Don’t sweat it, Retargeting.Biz is ready to take the stress of you from start to end of your campaign set up. We are tested and trusted in the ecommerce industry to do perfect retargeting campaigns for clients with an amazingly high conversion rate. Reciprocity: Give a little, get a lot!